A big thankyou must go to the Growers who have shown overwhelming support for the removal of Quintis as RE with the proxies received to date surging well past the voting threshold required. It is important for those who have not yet voted please send in your proxies voting in favour of all resolutions -asap. The recapitalisation of Quintis into a foreign owned private company raises concerns for growers as to where the investment return on $360m of transferred debt plus $125-175m of additional capital will come from. Growers’ best move is to remove themselves from the Quintis group to avoid the increased conflict of interest that the new structure represents. We have been disappointed by the news that Quintis staff and the Receivers have been holding private meetings with some select 2003 growers in an attempt to disrupt the momentum achieved by the SGC and the majority of Growers. In an act of desperation, we were informed that that they have been discussing offers to buy out the interests of some select larger growers before the vote. Pleasingly, most growers have been astute enough to realise that this close to harvest it would be better to have the SGC market their trees in a competitive market. If Quintis and the Receivers want those trees enough they should bid in the market like all other potential buyers. How they are able to do this whilst they are associated with the Responsible Entity owing fiduciary duties to the growers is uncertain and this is now the subject of complaint. Similarly, the Receivers late efforts of personally pursuing some SGC supporters and growers has not had any impact on the important grower matters that we remain focused on. 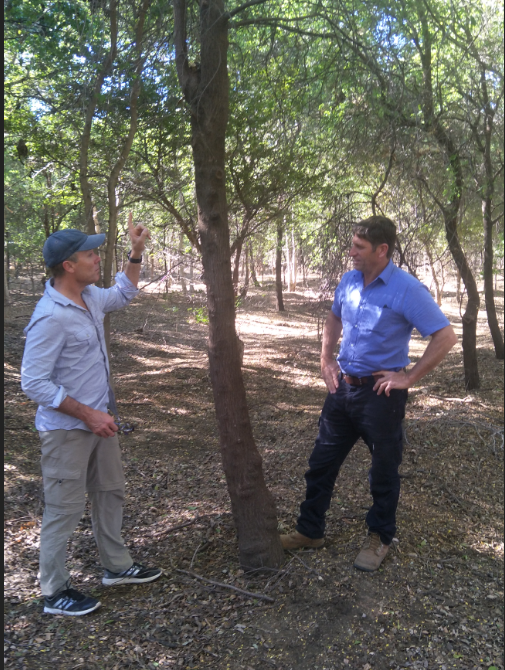 We were fortunate enough to inspect some of the 2003 plantations with an expert forester as part of the 2003 Gold Card trees we already manage only last week. The SGC is confident and looking forward to implementing a range of measures aimed at significantly increasing the yields available to growers. Let’s not forget the disappointing 2002 result where the same Quintis management plucked out their own trees to be set aside and dumped our trees in a shabby tender process that dropped the price 40%. Don’t give them that chance again – vote for the resolutions. Please remember that failing to vote is effectively a vote against the resolutions supported by Growers. Amongst all the hard work it has been and will continue to be very rewarding by having the opportunity to deliver better results to growers and it has been most encouraging to have your support, thank you. We know you are being inundated by information from both sides but latest Quintis update must be responded to due to its blatant and deliberate misinformation. The SGC is holding proxies from growers which are well over the 50% threshold to pass all resolutions at the July 23 2003 growers’ meeting to dump Quintis as RE and Manager. The SGC welcomes growers to come and inspect the proxies for their own peace of mind. Neither Quintis nor its associates can vote at the 23 July meeting as they are not independent growers for the purposes of the resolutions being put to the meeting. Accordingly with the SGC already holding proxies for over 50% of the growers entitled to vote ( which is more than required to pass all the resolutions ) and with nearly 3 weeks remaining for the SGC to receive additional proxies from growers who have not yet voted but have indicated they support the SGC we believe it is correct to say the SGC is surging to victory. Did you receive an invitation to meet Shaun Fraser when he was in Perth last week? In addition to the legal proceedings mentioned by Quintis they have omitted two other Supreme Court legal actions initiated by Mr Wilson where he is suing the ex Quintis directors and current Quintis management for defamation and negligence. In addition they have not explained why the Receivers are not seeking to examine the former directors of Sandalwood Properties Ltd ( SPL ) and Quintis Ltd over the various established breaches by SPL of their Responsible Entity licence , or the grower tender that resulted in a related party buying the grower wood for a 40% discount to the previous tender price? Reduce the price paid to growers for their wood by 40%. Reduce the price Quintis sell their oil to their major customer by 33% . Lose the 10 yr Mount Romance supply contract with the Forests Products Commission. The above matters do affect growers and returns to growers and it would be good if the Receiver’s and Quintis spent some time addressing important matters like: How do they intend to fix this dysfunctional management team and improve returns to growers at the same time as ensuring their client Blackrock recovers its soon to be $500m investment? The SGC is continually accused by Quintis of misleading growers . Did we mislead growers about the recapitalization flop , shareholders being shredded , and Blackrock taking control? Did we mislead growers about Quintis losing the 10yr Mt Romance supply contract with the Forest Products Commission? Did we mislead growers about the outcome of the 2002 grower vote ? Or the 5 previous grower scheme votes for 2002, 2003 , 2004, 2004 Premium, and 2005? Did we mislead growers about the 40% discount to growers in the 2002 project? Did we mislead growers about the appalling manner in which the 2002 grower wood was displayed for “ sale “ in a hot tin shed in Kununurra? Did we mislead growers about the complete dysfunction and lack of respect between the Quintis forestry team and their senior executives Matthys, Stevens and Thompson? Please ring Brett Blunden Head of Forestry, or Matt Barnes Deputy Head of Forestry to confirm. We will continue to inform growers about the truth regarding Quintis, the Receivers, and Blackrock and strongly restate the recommendation for growers to remove themselves from this chaotic and financial mess.